When I was at school, cookery lessons were rubbish. We learnt very little about health and nutrition and generally actually cooked about once a term. As you can imagine, I dropped the subject as soon as I could and didn’t take it for GCSE. Fast forward ten years when my younger sister was in school, and things were completely different. All of my sisters learnt about the benefits of healthy eating and became very accomplished bakers during their school years. Unfortunately, it seems that cookery in schools has regressed somewhat and is no longer a priority. That’s why I was delighted to hear about the Kids’ Cookery School (KCS), that provides a mobile kitchen van teaching disadvantaged children about cooking and eating healthily. The KCS is supported by the water filter company Brita, who have recently donated £10,000 to the charity, allowing them to purchase ingredients to keep them going for the next 12 months. For us, eating healthily is an important part of our lifestyle and we are lucky enough to have been able to bring Libby up as a bit of a foodie. The tone was set long before Libby came along, when we went to Heston Blumenthal’s Fat Duck restaurant for hubby’s 40th birthday. That got us a little bit addicted to eating out at nice restaurants and we tend to do so around twice a year. We would rather do this than have birthday presents or go out more regularly to cheaper places. Libby has really had to fit in with this lifestyle, and if she was going to be eating at posh restaurants, she was always going to have to be a good eater. Luckily, Libby couldn’t agree more. So far, we haven’t found anything that she won’t eat. When we’re eating out, she behaves impeccably, just as long as we keep feeding her! Libby adores healthy food, olives are one of her favourite savoury items and if she could choose any dessert in the world, she’d definitely go for a big plate of blueberries. We put her great eating habits down to perseverance, if she wasn’t keen on something we’d just feed it to her every now and then until she got used to it. As I’m vegetarian, most of Libby’s meals are veggie too, although she will happily eat meat if she’s out. Of course, it’s not all health health health when it comes to food, Libby enjoys her chocolate as much as the next person and she certainly had a very happy Easter! 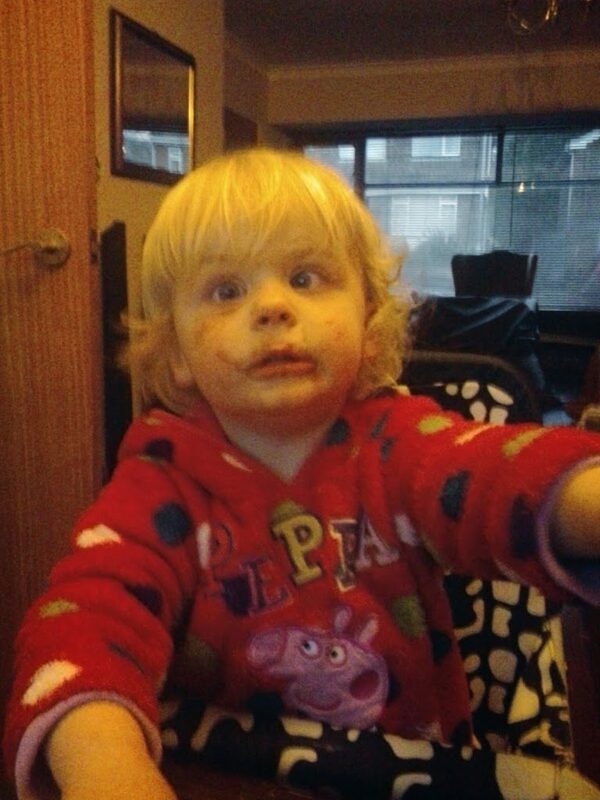 Here she is enjoying her chocolate egg, despite half of it ending up on her face! Previous Post Baby Eviction Techniques! What a great project:) I love to see kids eating a varied diet and not being stuck with ‘kid food’. Mine love olives, and have the same approach as you – offer things often and let them grow into an appreciation of complex flavours. Matts folks took us to Gordon Ramsey’s place near St Pauls after Matt’s graduation and the kids ploughed through their three course dinner. Maybe being veggie helps since you tend to think more creatively than the meat, potatoes and two boiled veg standard fodder? I don’t think we’ll ever be strict veggies though given how addicted my boys are to sea food.